Recently, I worked with a speaking coach, Ellen A. Kaye (1), to prepare a talk for Nerd Nite SF. I already wrote about the experience here, but wanted to add one more thing. One of the best tips I got from Ellen was to create a make-believe character to tell a difficult story. When I talk about HIV treatments I tend to say things like “imagine you are infected with HIV”, which can sound threatening, or “imagine a person who is infected with HIV”, which sounds impersonal. Ellen suggested making my example more specific, yet not threatening to the audience. 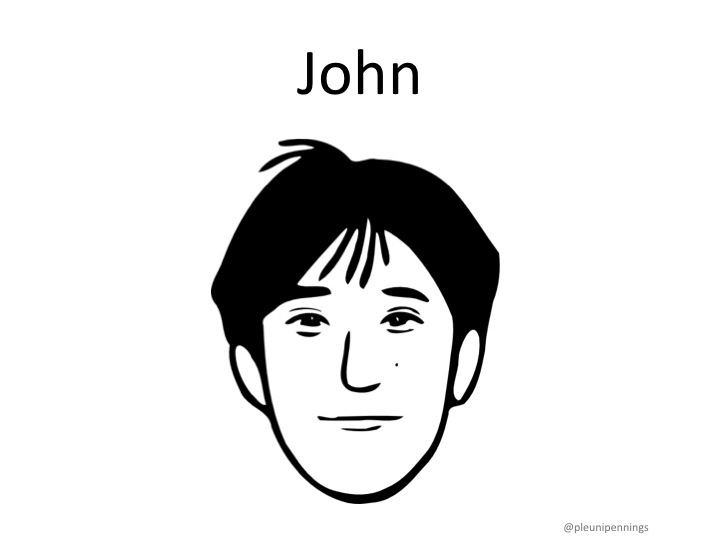 So I created “John” and said: “Imagine John is infected with HIV.” After introducing John early in my talk I could refer back to John many times during my talk and this made it much easier to explain everything. (1) Ellen A. Kaye founded Perfect Presentation® Inc, a multi-faceted speaking and coaching firm in 1994, which relocated to Silicon Valley in 2011. Ellen has coached clients for speeches and pitches to a US President, universities, keynote addresses; appearances on: CNN, The View with Barbara Walters, Fox Channel, Ted Koppel’s Nightline, national radio talk shows, IPO & VC pitches, sales presentations, PHD orals, interviews, meetings, civic speeches, and much more. Clients include Fortune 500 companies, Entrepreneurs and startups. After graduating from Stanford University, Ellen was a professionally trained actress in New York City working on stage and TV. Even though I am Dutch and I work on HIV, I knew almost nothing about Joep Lange when he died a couple of weeks ago in the M17 flight. For me, his name was mainly associated with one of his early papers, where he was not even the first author (Reiss, Lange et al 1988, Lancet). I frequently used a figure from that paper in my presentations (see below). The short paper, published in the Lancet in 1988, shows very clearly that the HIV drug AZT works initially, but after a few months HIV levels increase again. Later it became clear that this happens because HIV becomes resistant to AZT, which I am sure the authors suspected, but the word resistance doesn’t occur in the paper. The paper is important because it is one of the first that used quantification of HIV load to study treatment response. It also shows that world-class and important HIV research was coming out of the Amsterdam Medical Center. Later, of course, in the 1990s, it was discovered that combining three drugs in a “cocktail” was a good way to reduce the probability that resistance evolved in HIV. This discovery marked a turning point in the HIV/AIDS epidemic, and Joep Lange was involved in it too. Figure 1A of Reiss, Lange et al, 1988: Serum HIV antigen levels in two AIDS patients on zidovudine. 1. Joep Lange was a very successful scientist, but when asked about his career, he explained that he owed a lot to luck. For example, he was a young specialist in internal medicine, with an interest for infectious disease in the Amsterdam Medical Center (AMC) right when in 1982 the first cases of HIV/AIDS occurred in Amsterdam, so just by being in the right place at the right time, he could start a career working on HIV/AIDS. 2. I am slightly embarrassed to say that I had no idea – but learned from the radio interviews – that Joep Lange, and not David Ho, was the first to suggest that triple-drug cocktails (later called HAART, highly active anti-retroviral therapy, or simply combination therapy) would be the key to preventing the evolution of drug resistance in HIV and therefore sustained treatment success. 3. Joep Lange, like many others, was wrong about the “Mississippi baby” who was thought to be cured of HIV, but now turns out to still be HIV positive. In the interviews, Lange talks about four people who were thought to be cured: the “Berlin patient” (he got a bone marrow transplant from an HIV-resistant donor and is still considered cured), the “Mississippi baby” (who was given treatment from a few hours after birth, and seemed HIV negative for quite a while, but is now known to be HIV positive), and two patients in Boston (they got a bone marrow transplant and were negative for a while, but now turn out to be positive). What to read on viral evolution? I am teaching a new course this fall on viral evolution. 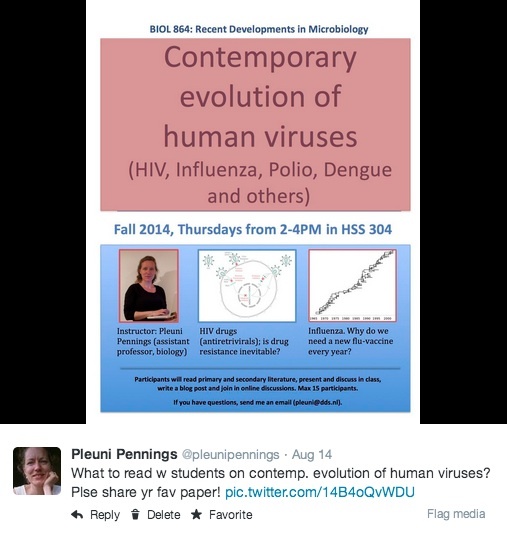 It is a seminar for graduate students and I want to find well-written papers on a variety of topics related to modern evolution of viruses.
.@pleunipennings I use the virus phylogeny in the courtroom papers for my teaching by @David_Hillis & others.Nice intro. to phylogeny.
.@pleunipennings Awesome! How about ERVs with something by @ArisKatzourakis ? Bryan Grenfell when thinking zoonosis. Drug resistance evolution in HIV, HCV, herpes viruses. How to make an attenuated strain for a vaccine? Evolution in response to vaccination (replacement, immune escape). More suggestions very welcome! Especially if you know of specific paper that are well written.